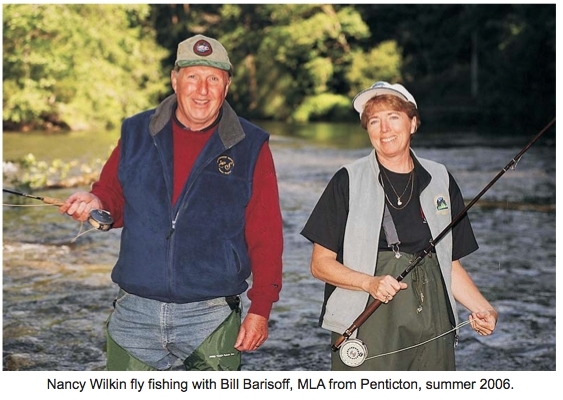 Nancy Wilkin was a strong supporter of FER and the wardens program during her time as the Assistant Deputy Minister (ADM) of the Environmental Stewardship Division in Ministry of Environment. Nancy retired from government this summer and will be an executive in residence at Royal Roads University beginning this fall. Thank you Nancy for your solid support to undertake the provincial Wardens’ get together in 2003; support for FER State of ER report through a grant to the University of Victoria Coop Program that allowed us to hire Morgan MacCarl; support to complete the Wardens handbook and most recently, support for area supervisors and FER wardens to meet. The work of NGOs like FER is so aided when senior management is supportive – thank you Nancy. For the record here is part of Nancy’s message from the 2003 Provincial Wardens’ Gathering held in Kamloops. Nancy considered the gathering important enough to not only attend and participate in but to fund as well. Nancy explained that the Ecological Reserves and the ER wardens fall under the Environmental Stewardship Division, Ecosystems Section; with local Area Supervisors responsible for the ERs and the wardens. Budgets are developed within Service Plans for each Section and signed off by the Minister. Nancy noted that not only are Wardens the eyes and ears of ERs, but also the soul of ERs. ER wardens are critical to ER protection and management. There has been a change in focus in Parks to revenue generation, which means Regional attention is not on Ecological Reserves. There is a need to provide the public, MLAs, business councils, etc. with more local information on ERs and their importance . Lack of public support for all protected areas places them in danger of being compromised. Wardens should have input to management plans for ERs. There is a need to formalize events like the Gathering and have regular contacts with the ADM and other upper-level managers to monitor progress and maintain dialogue. There is also a need to develop a list of proposed ERs and a plan for their creation over the next year. Nancy’s messages still resonate today – the need to ensure ERs are not compromised and that conservation becomes a high priority. However, reporting through the ADM has changed. The ADM of Stewardship Division is no longer in charge of Parks and ERs. Parks and ERs are managed by Scott Benton, Executive Director reporting directly to the Deputy of Environment. (see pages 1 and 2 regarding a meeting with Scott Benton).